Golfers competing in tour will experience the benefits of Swiftwick socks. Web.com player Steven Fox sports Swiftwick socks on the green. Swiftwick socks provide pro golfers the comfort and performance needed to be their best, round after round. We are excited to show golfers what runners and cyclists have known for years: Swiftwick is the athletes’ choice in socks! 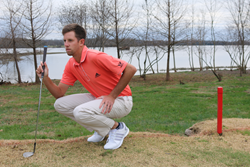 Swiftwick, a leading athletic performance sock company, is excited to show their support for professional golfers by partnering with the Adams Golf Pro Tour. The tour will kick off March 9, 2016, with a golf tournament in Louisiana, followed by Texas, Oklahoma, Missouri and Kansas. The Adams Pro Tour, a subsidiary of K&G Sports LLC., partners with local nonprofits in the mid-south region. These tournaments donate thousands of dollars to charity and provide up-and-coming golfers a chance to compete at the elite level. Many golfers, such as Mark Hensby, J.L. Lewis, Tim Herron, Cameron Beckman, Bubba Watson and Ryan Palmer have gone on from the Adams Pro Tour to win the PGA Tour. "Professional golfers are on their feet throughout their entire careers. So it made perfect sense to partner with Swiftwick,” said Tour President Gary DeSerrano. “Swiftwick socks provide pro golfers the comfort and performance needed to be their best, round after round. We are excited to show golfers what runners and cyclists have known for years: Swiftwick is the athletes’ choice in socks!" Each player competing in the tour will receive a pair of Swiftwick socks. The company has donated several colors from their ASPIRE line in ZERO and ONE inch cuff heights. While competing, golfers will benefit from Managed Compression, moisture wicking, blister free and anti-odor. To learn more about Swiftwick, visit http://www.swiftwick.com. Since 2008, Swiftwick has aimed to fuel any adventure with the best socks designed by athletes for athletes. By fusing personal experience with the most advanced fibers, Swiftwick’s superior socks will propel performance, so athletes can continue to “do what moves them.” Swiftwick is headquartered in Brentwood, Tenn. In operation since 1994, the Adams Pro Tour represents one of the best development opportunities for golf professionals to hone their competitive skills, while preparing for a life on the PGA Tours. The Tour operates 13+ professional golf tournaments each year in the mid-southern states of Texas, Louisiana, Oklahoma, Kansas and Missouri. Former players include PGA Tour winners Ryan Palmer, Patrick Reed and Bubba Watson.